VERY FINE. AN EXCEEDINGLY RARE NATIONAL BANK NOTE CO. 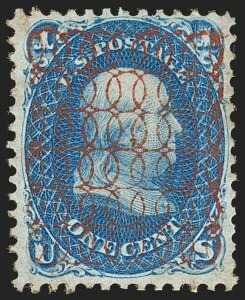 ESSAY OF THE 3-CENT 1861 ISSUE WITH A "ONE" NETWORK OVERPRINT. THIS REPRESENTS HALF OF THE ONLY RECORDED SHEET. The safety network overprint essays listed in Scott as 79-E26 are discussed in two important articles by James Lee, Richard Drews and Jan Hofmeyr in the 2016 and 2017 Chronicle (no. 251, pp. 260-274 and no. 253, pp. 64-72). Both Abram Gibson and Emanuel Harmon received patents for re-use prevention ideas based on overprinting intaglio engraved stamps with surface printed networks of light wavy lines in various colors. Either the intaglio ink or network ink would be fugitive and wiped away if an attempt was made to re-use the stamp. The essay offered here conforms to the Gibson patent and is so attributed in the second Chronicle article. This is the bottom half of the unique sheet. 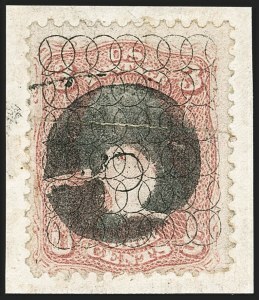 The top half was offered in Siegel Sale 1113 (lot 2195). 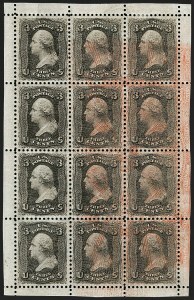 It is clear that the plate used to test this safety overprint was only four stamps high. Using what we can observe from this sheet and the unique "VEINTE" sheet of 12 offered in lot 281, it is evident that all the safety network essays were printed from miniature sheets of 12. VERY FINE. 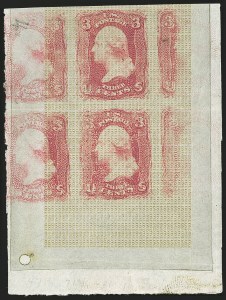 THIS IS THE ONLY RECORDED COMPLETE SHEET OF TWELVE OF THE 3-CENT 1867 ESSAY WITH THE "VEINTE" SAFETY OVERPRINT, ATTRIBUTED TO THE ABRAM GIBSON PATENT. The safety network overprint essays listed in Scott as 79-E26 are discussed in two important articles by James Lee, Richard Drews and Jan Hofmeyr in the 2016 and 2017 Chronicle (no. 251, pp. 260-274 and no. 253, pp. 64-72). Both Abram Gibson and Emanuel Harmon received patents for re-use prevention ideas based on overprinting intaglio engraved stamps with surface printed networks of light wavy lines in various colors. Either the intaglio ink or network ink would be fugitive and wiped away if an attempt was made to re-use the stamp. The essay offered here conforms to the Gibson patent and is so attributed in the second Chronicle article. This is the unique full sheet of 12 and serves as strong evidence that all the safety network essays were printed from miniature sheets of 12. VERY FINE. A CHOICE AND DESIRABLE GROUP OF THESE SCARCE NATIONAL BANK NOTE COMPANY SAFETY NETWORK OVERPRINTS, REPRESENTING EACH OF THE THREE TYPES THAT ACTUALLY EXIST. The safety network overprint essays listed in Scott as 79-E26 are discussed in two important articles by James Lee, Richard Drews and Jan Hofmeyr in the 2016 and 2017 Chronicle (no. 251, pp. 260-274 and no. 253, pp. 64-72). Both Abram Gibson and Emanuel Harmon received patents for re-use prevention ideas based on overprinting intaglio engraved stamps with surface printed networks of light wavy lines in various colors. Either the intaglio ink or network ink would be fugitive and wiped away if an attempt was made to re-use the stamp. The essays offered here conform to the Gibson patent and are so attributed in the second Chronicle article. VERY FINE. 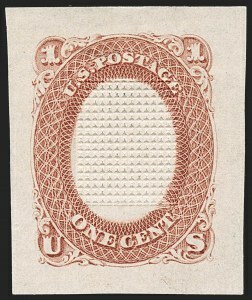 AN EXTREMELY RARE EXAMPLE OF THE "BEDSPRING" SAFETY NETWORK OVERPRINT ON THE ONE-CENT 1861 ISSUE, ATTRIBUTED TO EMANUEL HARMON. The safety network overprint essays listed in Scott as 79-E26 are discussed in two important articles by James Lee, Richard Drews and Jan Hofmeyr in the 2016 and 2017 Chronicle (no. 251, pp. 260-274 and no. 253, pp. 64-72). Both Abram Gibson and Emanuel Harmon received patents for re-use prevention ideas based on overprinting intaglio engraved stamps with surface printed networks of light wavy lines in various colors. Either the intaglio ink or network ink would be fugitive and wiped away if an attempt was made to re-use the stamp. The essay offered here conforms to the Harmon patent and is so attributed in the first Chronicle article. 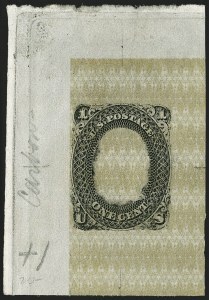 Harmon was from Washington D.C. and there is an example of the 3c 1861 Issue known with the Bedspring overprint tied to a piece by a Washington D.C. cancel (see Siegel Sale 890, lot 263). VERY FINE APPEARANCE. 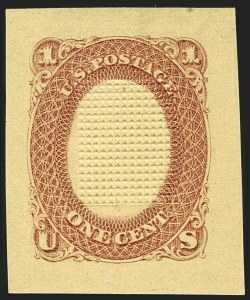 AN EXTREMELY RARE EXAMPLE OF THE "BEDSPRING" SAFETY NETWORK OVERPRINT, ATTRIBUTED TO EMANUEL HARMON, ON THE 3-CENT 1861 ISSUE WITH BUFFALO NEW YORK PATENT CANCEL. The safety network overprint essays listed in Scott as 79-E26 are discussed in two important articles by James Lee, Richard Drews and Jan Hofmeyr in the 2016 and 2017 Chronicle (no. 251, pp. 260-274 and no. 253, pp. 64-72). Both Abram Gibson and Emanuel Harmon received patents for re-use prevention ideas based on overprinting intaglio engraved stamps with surface printed networks of light wavy lines in various colors. Either the intaglio ink or network ink would be fugitive and wiped away if an attempt was made to re-use the stamp. The essay offered here conforms to the Harmon patent and is so attributed in the first Chronicle article. We are aware of only one other example with this Buffalo patent cancel. 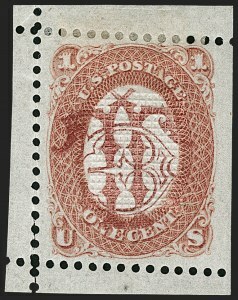 An example with a Washington D.C. cancel is also known (see Siegel Sale 890, lot 263). VERY FINE. AN EXTREMELY RARE EXAMPLE OF THIS NATIONAL BANK NOTE COMPANY ONE-CENT ESSAY WITH SAFETY UNDERPRINT. It has been reported that only two examples exist. We have not encountered the other. VERY FINE. TO THE BEST OF OUR KNOWLEDGE, ONLY ONE OTHER EXAMPLE OF THIS RARE AND BEAUTIFUL E GRILL ESSAY EXISTS. The other example of this essay has the same full perforations on three sides and has a straight edge at left (ex Thomas Morris Sr., Finkelburg, Geisler and "Lake Shore"). Therefore, it is likely that this was printed from a plate of two designs, which were then scissors-separated.